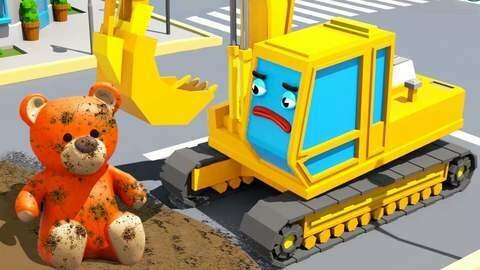 The Monster truck’s teddy bear birthday gift from the Police car gets stolen by the bad yellow Excavator in this 3D car cartoon for kids. They police car and monster truck chase it but the bear ends up in a puddle of mud. Luckily, the Fire truck was there to wash the teddy bear clean again. Enjoy other 3D car videos when you visit SeeZisKids.com.